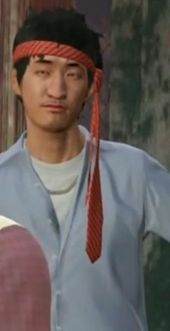 Tao Cheng is a character in the HD Universe who appears as a minor character in Grand Theft Auto V. He is voiced by Richard Hsu. Tao, born in Yangshan, China is the eldest child of Wei Cheng and an unnamed mother. He is a Chinese national who lives in Los Santos. He and his translator are sent by Triad leader Wei to discuss the possibility of buying large quantities of drugs from Trevor Philips. Trevor, however, ends up locking them into the storage freezer outside his laboratory to protect them from the Aztecas street gang. Tao and his translator are later released from the storage facility and quickly leave, advising Wei to do business with the O'Neil brothers. Trevor, however, kills the O'Neil brothers, leaving the Triads without a partner. The Triads later kidnap Michael De Santa, believing him to Trevor's lover, but their plans to exact revenge are thwarted again when Trevor ignores their demands and Michael is rescued by Franklin Clinton. The player, if choosing to save Michael and Trevor, will, as Franklin, later kill Wei Cheng, as the they attempt to take out their enemies, and locates Wei by having Lester Crest trace Tao's credit card to a beach club in Pacific Bluffs. Tao Cheng is with his father at the time and can be killed, although there is no requirement to do so. Tao Cheng is shown to be able to speak very limited English, mostly proper names from Lifeinvader to North Yankton. Tao, in both Trevor Philips Industries and Crystal Maze, is shown to be either high or drunk resulting in him ignoring the situation and talking about various irrelevant things. Since using a sticky bomb to kill Wei Cheng is necessary to achieve a gold status and 100% in the mission, it is implied that canonically Tao would be killed in the explosion. This page was last modified on 23 September 2016, at 09:18.